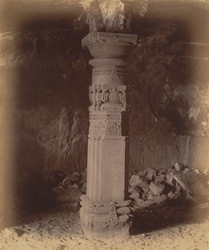 Photograph of a column in the hall of the Jain cave temple at Tringalvadi taken by Henry Cousens in the 1880s to 1890s. Tringalvadi is a small village, situated in Maharashtra close to Igatpuri. The cave temple is now in a poor state of preservation, although when it was first constructed it would have been an impressive sight. The cave consists of a veranda, a large hall about thirty five feet square and an antechamber with shrine. The veranda incorporates an outer parapet wall from which rise two pillars supporting the outer eave. Cut into the veranda's ceiling is a large sculpture depicting five human figures. The Bombay list, p. 49 states that: ''Within, the hall the ceiling is, or was, supported by four columns set square in the centre; the walls and ceiling are plain. Only one pillar now remains intact, the others being more or less destroyed...'' The shrine is adorned with a large Jaina, again in a poor state of preservation.